Soulcalibur has always been my favourite fighting series, a deft blend of accessibility, character, and spectacle. Its universal control system means that the same input will perform a move with almost any character, so anyone can pick it up and learn to play within minutes. In addition, I’ve always preferred its colourful array of 16th century warriors to the character rosters of Street Fighter and Mortal Kombat. Ultimately though, it’s the flow of Soulcalibur that truly appeals to me. There are more visceral fighting games and more visually stunning fighting games, but none have the grace of Soulcalibur’s swordfighting. 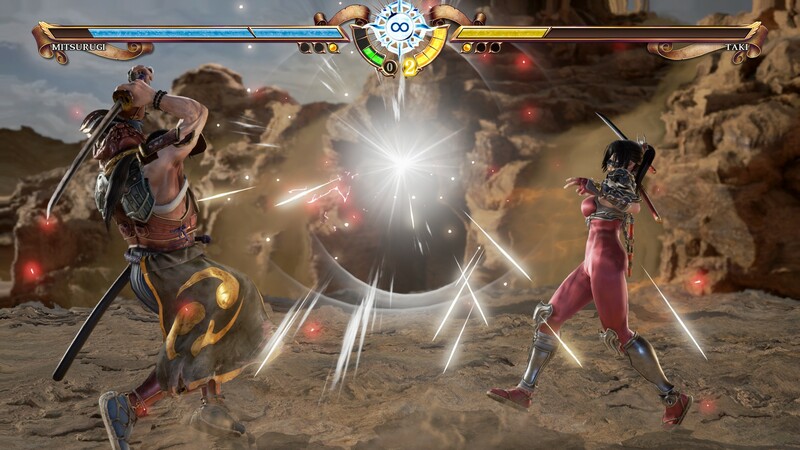 Where Street Fighter’s brawling happens to a staccato beat, Soulcalibur’s characters move like liquid, able to circle, sidestep, block and parry in fights that are as much dances as they are duels. As such, I’m delighted that Soulcalibur is back. This sixth entry in the series is the first for as many years. What’s more, I’m comfortable saying that, from a combat perspective, this is the best Soulcalibur has ever been, beautiful to watch and slick to control. As a package, however, I’m slightly less convinced. The game doesn’t exactly lack for content, but in the process, it sacrifices focus for breadth. Let’s talk about the good stuff first. 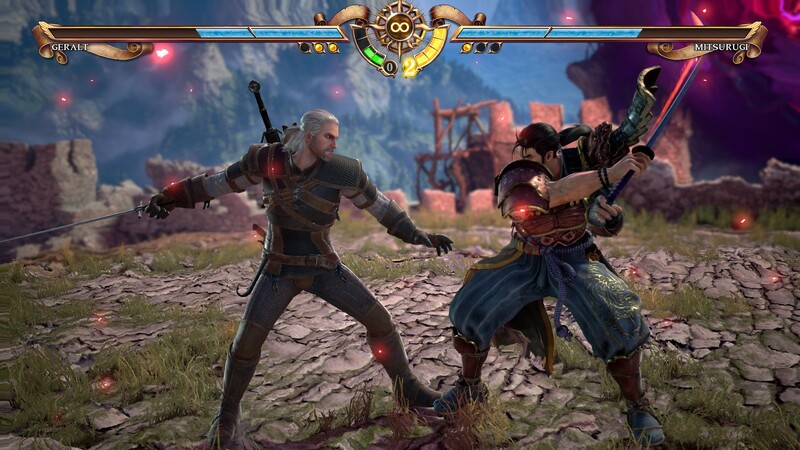 Soulcalibur VI pits 21 characters against one another in yet another quest to track down Soul Edge, the legendary sword that the various characters seek either to wield or to destroy. 18 of these characters return from previous games with their costumes and fighting styles largely intact. 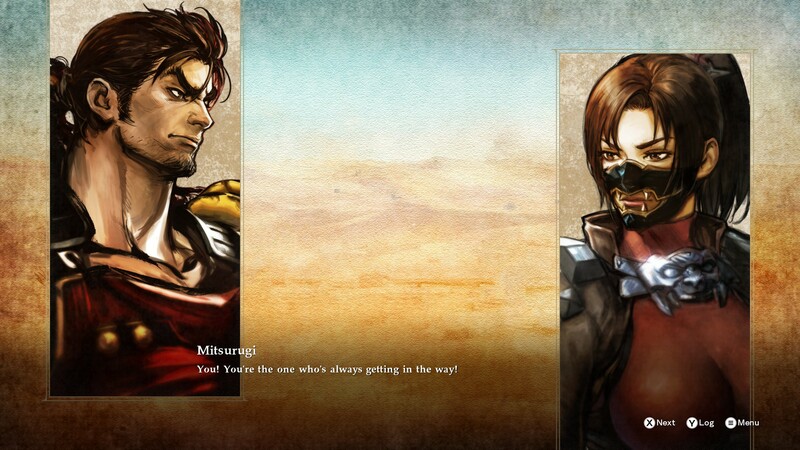 Taki still charges forward with her knife when you press forward and vertical attack, Mitsurugi can still impale opponents on his katana before kicking them off the blade, and Voldo still spends half of any fight crawling around like a spider with a leather fetish. There’s plenty here that’s familiar, but that’s not to say it’s the same. The game’s biggest and undoubtedly best change is the introduction of the 'Reversal Edge' mechanic, a parrying attack that slows down time and briefly turns the game into a deadly match of Rock, Paper, Scissors. In these moments, players can choose between three different attacks, each of which counters another, or simply try to dodge their opponent entirely. 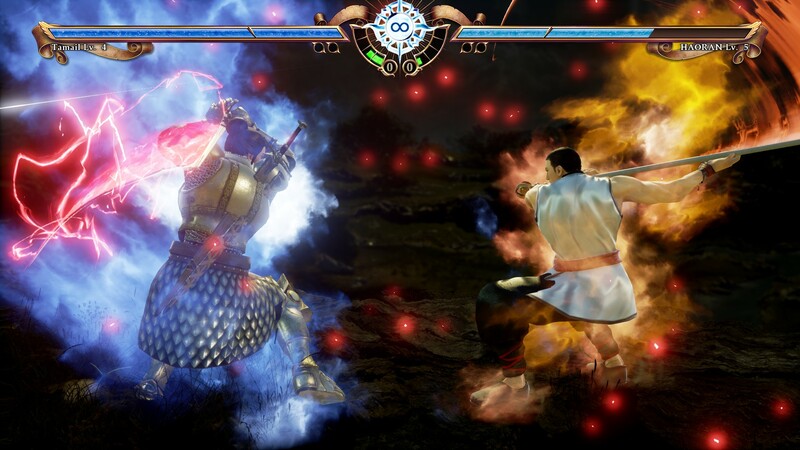 Not only do these moments offer a greater cinematic flair to Soulcalibur’s duels, they’re also a suitably dramatic way to try to regain the upper hand in a fight (although success is by no means guaranteed). Meanwhile, as fights progress, each player builds up Soul Energy, which can be used in two ways. 'Soul Charge' sets your weapon alight with indigo flames, unlocking a new tier of moves and slightly altering how each weapon functions. Alternatively, Soul Energy can be unleashed in a single, devastating attack, often unfolding in multiple stages. 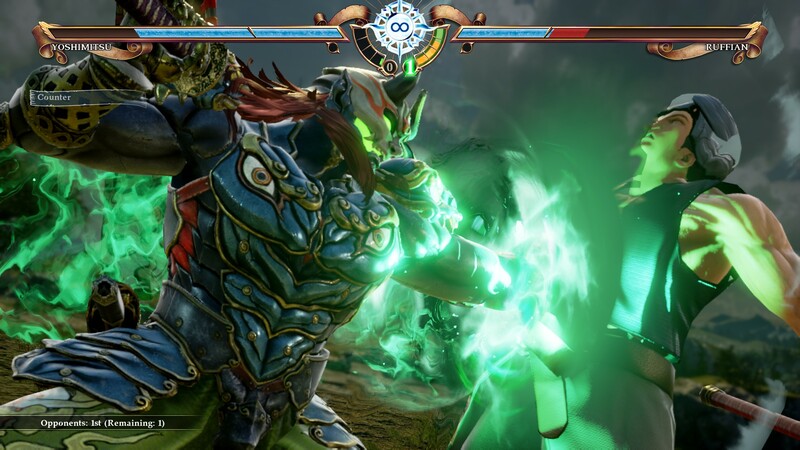 Yoshimitsu rips the soul from an opponent’s chest before shattering it with his sword, while the fallen Knight Nightmare conjures up a spectral steed and devastates his opponent with a one-man cavalry charge. These new systems provide enough differentiation for the many returning characters without forcing the developers to fundamentally change their move-sets and alienate the fanbase. There are also three brand new characters to play as, each of whom is very different from the others. Azwel is a magician able to conjure up elemental weapons from thin air, while Groh is a grouchy mercenary type wielding a staff that can rapidly be switched into two swords, a gimmick reminiscent of the trick weapons from Bloodborne. 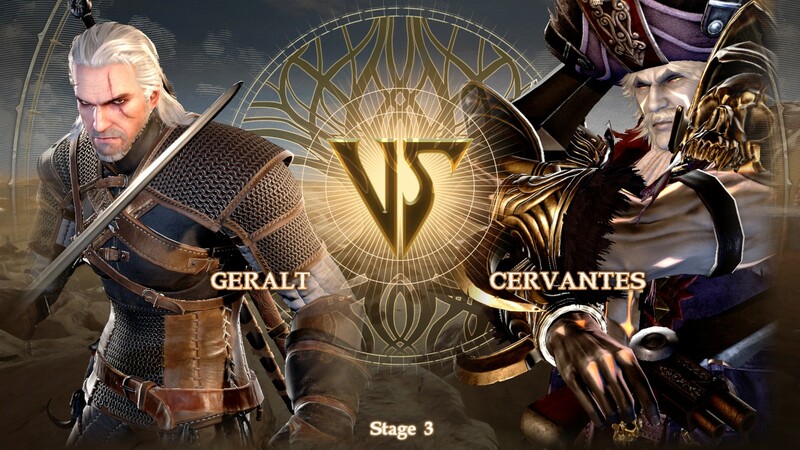 Most notably, however, is the guest appearance of The Witcher’s Geralt of Rivia, whose blend of lithe swordfighting and limited spellcasting fits perfectly into Soulcalibur’s combat. Geralt is a fine starting character, a perfect blend of speed, power, and reach, and he can use his silver sword to deal massive damage to Soul Charged enemies. I also love his special move, in which he strikes down an opponent then uses his Axii mind-control Sign to make them stand back up so he can hit them again. It’s very satisfying, and very Geralt. Mechanically, Soulcalibur VI is comfortably the best entry in the series, maintaining the core of the game while adding just the right amount of changes and additions to make a sequel worthwhile. It’s also a fantastic multiplayer game, especially played locally with friends, making it stand out from the likes of Street Fighter, which is much more focussed on competitive play. All that said, I’m less convinced by the single-player offering. Now, anyone who comes to a beat-‘em-up for the story should probably be checked over by a doctor for concussion, but Soulcalibur always had greater narrative aspirations than its peers. Some of the story conclusions for the fighters in the original Soul Blade are forever burned into my memory, not least the tragic corruption of the brave Knight Siegfried before he became better known as Nightmare. Soulcalibur VI is clearly aware of this heritage, and in some ways its approach to narrative is more ambitious than ever. There are not one but two story modes. The first is a traditional-ish story campaign, including a central tale revolving around the character Kilik and shorter stories that focus on each character. 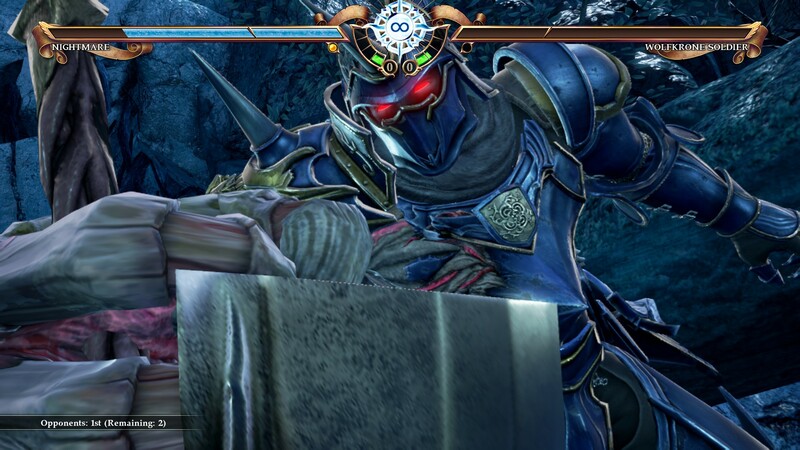 In addition to this is the 'Libra of Souls' campaign, wherein players create their own character (using one of the existing character’s movesets) and set off on a lite-RPG journey across the Soulcalibur world, taking on missions, levelling up, and even making choices that affect the outcome of the story. As I said, this is pretty ambitious stuff for a beat-‘em-up. Unfortunately, the game doesn’t really have the resources to pull both these modes off well. All stories are told through static dialogue screens, and in both cases there is far more dialogue than there is actual fighting, which would be fine if the dialogue was interesting enough to justify it. A couple of the character stories did draw me in. Yoshimitsu’s tale is surprisingly engrossing, and as a die-hard Witcher fan, it was undeniably fun to watch Geralt wander the Soulcalibur universe with his typically weary demeanour, even if his tale amounts to little more than wandering. Nonetheless, I think the game would have benefited from concentrating on one of these two ideas, making it more cinematic or just better tying the stories into the fights. A few good cutscenes would be far more effective than the reams of lumpen dialogue the game opts for instead. In the end, however, you come to Soulcalibur for the blades, not the banter, and in Soulcalibur VI the blades are finely honed indeed.